This add-on allows you to set a discount on a group of products attached to each other. When customer add to cart the “primary” product, he will see a block “Buy together” which offers him to buy additional products attached to it and get a discount. When the install link is available, click on it to install the add-on. to percentage of the original price - the total price of combination will be reduced to the percentage of the original price. 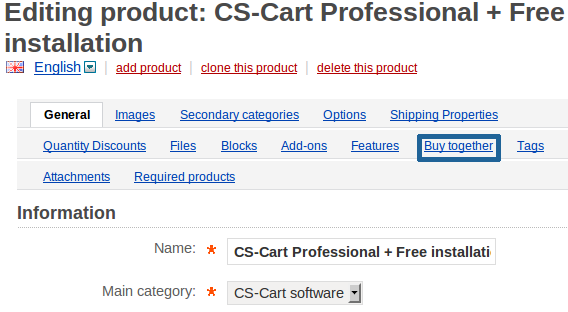 "It's good, but when adding a combination, the product price is equal to 0 (in IE7/IE8). It works correctly on IE9, FF, Chrome, ..."